The withdrawal of animal welfare-branded shopping bags has raised some important questions about the growing power of ethical consumption. 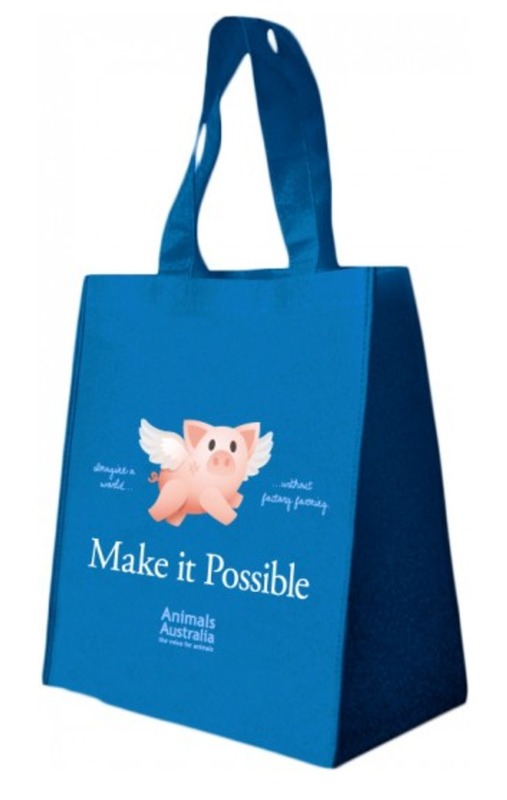 Last week, Coles supermarkets began selling shopping bags on behalf of animal rights campaigners Animal Australia. Following a backlash from farmers, Animals Australia withdrew the bags. But the stoush raised some important questions about the growing power of ethical consumption, and about who gets to decide how much animal welfare is enough. The animal rights group produced 15,000 bags displaying a little winged pig who encourages consumers to “believe in a world without factory farming”. They were to be sold in 500 metropolitan Coles Supermarkets. The National Farmers’ Federation (NFF) urged producers to boycott Coles, saying Animals Australia were “anti-farmer”. Since ending the campaign, Animals Australia has raised enough in donations from sympathetic Australians to secure valuable air time for their television ad. According to the Canberra Times, Coles also received huge support in favour of the bags – leading many to ask why farm lobby groups are so strongly opposed the campaign. Why don’t farmers like animal welfare campaigns? The supermarket giant is trying to cater for the growing demand for high-welfare meat and eggs while remaining supportive of producers. But several farming lobbies called for immediate action against Coles in response to the bag sales. Farmers groups didn’t object to a campaign to end factory farming. They objected to Animals Australia and its platforms. A representative of the pork lobby expressed his outrage that Coles would partner with an “anti-meat” organisation, and described Animals Australia as campaigning for a “meat-free world”. At the core of any animal rights ideology is the objective to reduce suffering, as animal activists explain. Getting sows out of stalls and chickens out of cages is the first step in this process. Farmers say they also care about welfare. But farming lobby groups such as the NFF feel vulnerable to the effects of marketing campaigns by animal rights groups. While animal welfare is important to farmers, there is immense pressure to supply chicken, pork and eggs to consumers at a low cost. This is why the factory farms that Animals Australia are protesting against exist. The Farmers Federation says it works with respected animal welfare groups and the government to make improvements in the industry. But they seem to think there is no place in the debate for a group that campaigns for animal rights; a group they describe as “extremist animal activist[s]”. Farmers label the group as extremists because they campaign for an end to rodeos, no more kangaroo culling and no more culling of introduced animals. But these are different matters: if farmers are opposed to Animals Australia’s anti-factory farming campaign because it is based on false claims, they should tell the public what they are doing to improve farm animal welfare. Can high-welfare foods work for supermarkets and producers? Rather than trying to turn Australia vegan, Animals Australia told the Age they want Australians to “eat less and pay more [for meat and eggs] – ensuring that the bottom line for producers can remain positive”. To achieve this requires a dramatic shift in thinking by consumers and support for supermarkets and farmers to supply high-welfare foods to the public. An open conversation between producers, supermarkets, and consumers on the realities of farming, include the unpleasant truths, may help Australia move forward and implement more animal-friendly farming practices. Both meat farmers and Animals Australia agree that consumers need to know more about farming in Australia. The Farmers Federation say on their website they are dedicated to increasing awareness of farming’s role in society. When transparency and labelling standards are improved, it will be the consumer who determines the importance of animal welfare – and rights – in the scheme of things. The Business Benchmark on Farm Animal Welfare has found welfare is not keeping up with consumer demands. Consumers' concern makes them sensitive to campaigns such as “Make It Possible” and open to alternative products and lifestyles. On the surface, the farming organisations who were calling for an immediate boycott of Coles have won the debate. But they have done little to convince consumers they needn’t worry about farm animal welfare. Australian consumers, and subsequently legislators, will determine the direction for farm animal welfare in the future. It is in the best interests of the meat and egg industries to reassure consumers that animal welfare is a priority. Otherwise Animals Australia will have gained much more from the proposed boycott than anticipated. Sally Healy was the 2011 recipient for the RSPCA Australia Scholarship for Humane Animal Production Research.